How to describe the issue. I got a 70-200 AFS VR original model. On my D3s it seems to operate fine in FX mode with just a touch of softer corners with both VR on or off. I tried this lens on my D810 when I got the camera and found it lacking in focus. I thought it just didn't hold up with the 36MB sensor. Well today I put it to a real series of testing. Jury still out but I'm suspecting that the power requirement of running the VR is not good enough for this lens. With VR ON using various shutter speeds from ~1/60 - ~1/250 it get real soft on the right side. Even putting it in DX mode the right side is soft. The focus from the center to the left side is spot on in both FX and DX mode. Turning VR off and putting the camera on a tripod gives me clean images better than the D3S with the same corner performance. Left and right side are of equal in sharpness. The VR for whatever reason really is messing the focus up on the right side. I also tried several other lenses 50 1.8, 20 1.8 and 105 f2 all seemed to be even focus left to right. The VR lens elements could be out of alignment, or there is an issue with the gears. I spent a couple hours more testing this lens, again with a D810 and D3s. I was thinking a misaligned element. But testing without VR showed it preformed fine on both cameras. Again the w/D3s VR normal on seemed even left and right then it surprised me it was even with the D810. Again w/D810 I then selected active and it went very soft on the right side and the center to far left was very sharp, selecting normal mode agan it stayed very soft on the right. I shut everything down removed the lens, put it back on with the VR off and selection set to normal. Once I turned on the camera turn VR on and it works fine in Normal mode. I now thinking some electrical issue, it is 10+ years old. I will just not use the active mode. More testing next week to re-confirm this issue. Active VR mode does have issues, unless used under the right conditions. I've yet to find it helpful for anything. And I thought I was going crazy! 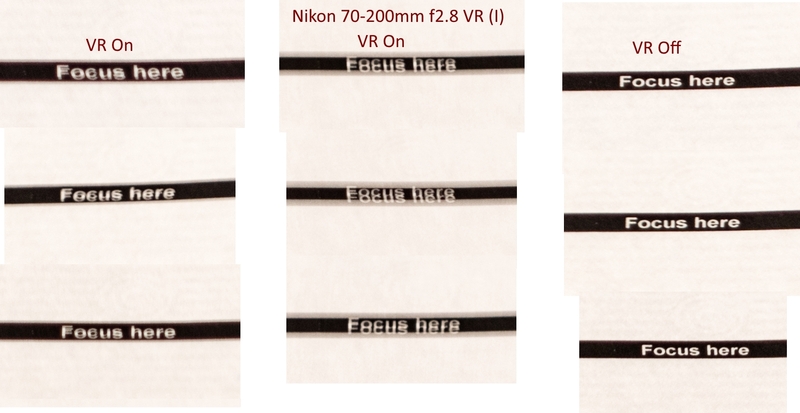 I too am having a similar issue with an identical setup: Nikon 70-200mm f2.8 VR (I) on a D810 body. I recently acquired the 70-200 and the first time I look it out (local x-mas lights on mainstreet at night) all my images were blurry / not sharp. Turned off VR and things cleared up and look great (respectively with ~1/60sec shutter hand held / monopod). Has anyone found a fix? I've tried various VR settings and procedures as above but nothing seems to help at the lower shutter speeds. Seems ok or less noticeable at higher shutter speeds but I can only assume the faster shutter speed doesn't capture the induced vibration/shake/double image from whatever is going on. Some examples: All are hand held ~1/80sec f2.8. Middle 3 I intentionally added some additional camera shake. The VR1 is an older model, I rented several for weddings and sports events (evening/night shooting often) and didn't notice that issue. I'm not sure it's common enough of an issue for Nikon to release a firmware update. I doubt you'd see one now, since it's been out of production since 2009, and warranty support for at least 3 years now. Given the age of the lens, it's possibly a hardware issue. When you take photos, do you push the shutter down all the way all in one motion, or do you half press the shutter for a few seconds and then shoot? It takes a few seconds for the VR to adjust itself to any vibration. You typically want to anticipate shots, meaning have the shutter half press for 2 seconds before releasing the shutter, rather than waiting till the last second and just fully depress the shutter in one go. WOW a 2 YO thread I started. What I did to fix my issues was sell my VR (1) version to someone with a DX camera, thay paid me good money and was happy to get it. I then found a really nice VR2 version without a foot and hood for the same money I got for the old one. A couple of weeks trolling fleabay and I found a RRS foot for $30 and a hood for $12. This VR2 ended up being a fabulous lens. I would not trade it for the latest VR3 for even.